White Christmas starring Danny Mac is to run at the Dominion Theatre in London’s West End this Christmas. The Irving Berlin musical will run from November 15 to January 4, 2020, with press night on November 25. Mac will star as Bob Wallace alongside Dan Burton as Phil Davis. Both reprise their roles following the show’s run at Leicester’s Curve. Further casting is to be announced. White Christmas has music and lyrics by Berlin and a book by David Ives and Paul Blake. It is directed by Curve artistic director Nikolai Foster and choreographed by Stephen Mear. Set design is by Michael Taylor, with costume by Diego Pitarch, lighting by Mark Henderson, sound by Tom Marshall and musical supervision by Stephen Brooker. White Christmas is produced by Jamie Wilson, Mark Goucher, Gavin Kalin and Kevin McCollum, with Jason Haigh-Ellery, Laurence Myers, Colin Ingram and Peter Kane for Intheatre Productions and Curve. Club Tropicana Is A Hit! Our star cast is led by Joe McElderry (X Factor winner, Joseph and his Amazing Technicolor Dreamcoat), Neil McDermott (EastEnders, Eugenius! ), Kate Robbins (Spitting Image, ITV’s The Imitation Game, Dinnerladies), Emily Tierney (Eugenius! Wicked, The Wizard of Oz); and former Sugababe star Amelle Berrabah, making her musical theatre debut. Set to a soundtrack of some of the most iconic, chart-topping acts from the 80s, including ABC, Cyndi Lauper, Frankie Goes to Hollywood, a-ha, Culture Club, Kenny Rogers and Dolly Parton, Bucks Fizz and Depeche Mode; experience their hits all performed live on stage, featuring: GIRLS JUST WANNA HAVE FUN, TAKE ON ME, JUST CAN’T GET ENOUGH, OOPS UPSIDE YOUR HEAD, THE LOOK OF LOVE, MAKING YOUR MIND UP, RELAX, ISLANDS IN THE STREAM, SHE DRIVES ME CRAZY, DON’T GO, LA DOLCE VITA, SURPRISE, SURPRISE, CHURCH OF THE POISON MIND, FANTASY ISLAND, UP WHERE WE BELONG, I COULD BE SO GOOD FOR YOU, FANTASTIC DAY and many more! The production, directed by Sam Yates (Glengarry Glen Ross), also stars Elizabeth McGovern, known to millions for her portrayal of Lady Cora in the multi award-winning drama series Downton Abbey. The Starry Messenger will begin performances at theWyndham’s Theatre on Thursday 16 May (Press Night: Wednesday 29 May at 7:00pm) and play a strictly limited 13-week season. Actor, writer, presenter, comedian and two-time Olivier award-winner Griff Rhys Jones returns to the West End alongside BAFTA and British Comedy Award winning comedian Lee Mack, who is making his West End debut. They are joined by Mathew Horne (Gavin & Stacey, Bad Education). Fanatical about protecting his wealth, the paranoid Harpagon suspects all of trying to flinch his fortune and will go to any length to protect it. As true feelings and identities are revealed will Harpagon allow his children to follow their heart, or will his love of gold prove all-consuming? Passion and purse strings go head to head in this hilarious new adaptation by Sean Foley and Phil Porter of Moliere’s classic comedy, opening at the Garrick Theatre on 1 March 2017. This major revival is directed by Sean Foley (The Painkiller, The Ladykillers, Jeeves and Wooster). Book now to be among the very first to see this major revival. Get in touch today for information on investing in The Miser. Gavin Kalin Productions is proud to work with Ambassador Theatre Group in bringing Buried Child to the West End. An absorbing and effecting night of true theatrical drama performed by the finest ensemble cast on the West End stage. Westworld star and Hollywood legend Ed Harris stars in the universally acclaimed and completely unmissable Pulitzer Prize-winning ‘masterwork’ (New York Times), Buried Child by Sam Shepard. Described as ‘Harold Pinter meets Eugene O’Neill – a great family drama with a bitumen black heart’ (Whatsonstage) and ‘wickedly funny, full of rich black humour’(London Theatre), Buried Child is set in rural America as it reels from a recession and political unrest. The similarities between then and now are strikingly compelling with the Financial Times stating, ‘Sam Shepard’s ripe slice of American gothic with its deeply dysfunctional family symbolic of a divided and disillusioned America’. Gavin Kalin Productions is thrilled to announce a partnership with AC Music Entertainment to bring Impossible to Asia. The production will open in Singapore in March 2017. Having premiered in London’s West End in 2015, Impossible has gone on to dazzle audience members and critics alike with its fusion of grand illusion, close magic tricks, death defying stunts and technical wizardry. Not content with being the most astounding magic show in the UK, Impossible launched a world tour in 2016. September 2016 saw Impossible debut in the United Arab Emirates at the Dubai Opera (the first purpose-built, world-class multi-format performing arts theatre in Downtown Dubai) where the production broke all box office records. Be sure catch the magic spectacular from 10th to 19th March 2017, at the Kallang Theatre, before it continues to tour throughout Asia. Tickets are released soon. The Dresser opens at the Duke of York’s Theatre in October 2016 after a four week initial UK short tour. Starring two of the UK’s best loved actors, Olivier award winner Ken Stott as Sir and the creator of the hit sketch show the League of Gentleman Reece Shearsmith will play Norman. The Dresser will be directed by the multi-award winning Sean Foley. Both hilarious and poignant, The Dresser explores the relationship between two men who are reluctantly and inevitably co-dependent. As World War II rages, backstage in a provincial English Theatre, an aging, once famous classical actor is troubled. Sir, the last in a dying breed of great English Shakespearean actors, is unwilling to take to the stage to deliver his renowned portrayal of King Lear. It falls to his faithful dresser Norman to rouse another great performance from him, to keep both the show and its star from falling apart. Gavin Kalin Productions are proud to be part of the producing team bringing this fantastic play back to the UK. IMPOSSIBLE returns to the West End for 60 performances this summer. 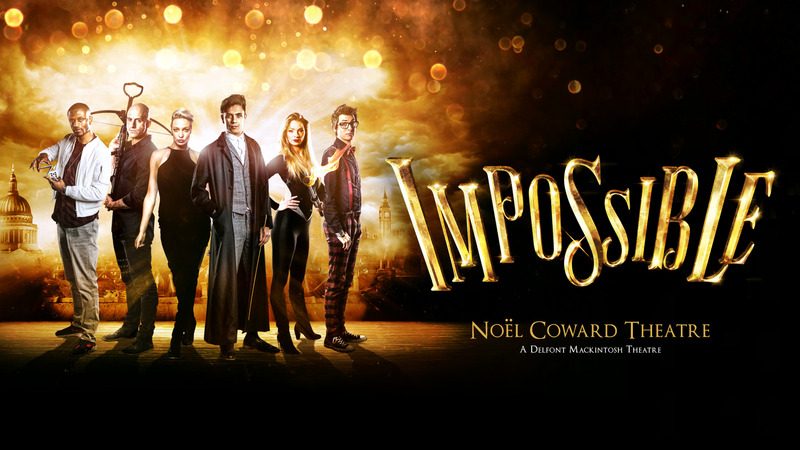 The show, which features the world’s greatest illusionists including new cast members Josephine Lee, Sabine Van Diemen and Magical Bones, will begin performances at the Noël Coward Theatre on Friday 8 July and run through to Saturday 27 August (Press Night: Wednesday 13 July at 7:00pm).